You know how you never have enough lights to do the shot you want? Today I am going to solve this problem once and for all. I’m going to show you how to get all the light sources in the world for just a few bucks. How? With LEDs. Lighting with LEDs is a ton of fun. It is also a great way to practice lighting. Why? Because LEDs are cheap. Having a ton of LEDs allows you to position a huge amount of light sources on any miniature detail oriented given setup – Provided that the setup is small enough. There are a few things that you need to consider when going in the path of LED lighting. LEDs are really cheap. I get my fix at DealExtreme where you can literally get tens of them for about a dollar. (This is like 10 times cheaper than Amazon). Another thing about LEDs is that (at least the ones I got) have a creepy cold white balance and poor CRI. The white balance can be taken care of once you shoot RAW (which I heatedly recommend when using LEDs). The CRI (Color Rendering Index) is a tougher issue. It will give you a certain look – it is OK for some images, however it takes from the how real the light looks. Last thing on LED basics is that LEDs are small. That means that they provide hard light. 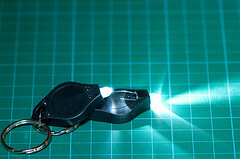 In fact they are so small that they provide very hard light. Now, for the sake of fun, I lit all the pictures in this article with LEDs, even the illustrative ones that I would normally light with a strobe. You know eating my own dogpile. This is one of the first things you’ll notice about LEDs. Since they are so small and weight close to nothing, setting them up is a very small effort. Using a bit of Gaffer’s tape you can stick ’em almost anywhere. Like on a chair, like I did in the shot on the left, which is part of the ring light illustration that I did. Another option is to simply place the LEDs on the ground, like I did on the image above. When doing this, you need to remember that light is very focused and will not go upwards. This means that only the bottom of your object will be lit. This is OK for some types of shots. 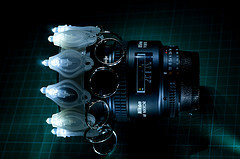 If you need some light going up, though, you can even place LEDs on top of each other to create a small ad hoc tripod. This is another trick I used on the ring light illustration shot. Last option is to use some plasticine to attach the LEDs to any smooth surfaces, or to give them a slight rise or decline. Since LEDs are so cheap, you can make banks of LEDs to create interesting lighting that will usually cost you big dollars. If you closely look on the image on the left, you will recognize the shadow signature of a ring light – there is a cool shadow thing going to all directions of the shoes. YAP it’s a LEDs operated ring light. (And yes those are the same shoes). Step 1 – Create a Velcro hook strap that wraps around your lens + 2 centimeters. I used self adhesive Velcro for this. At those 2 extra centimeters, attach some loop Velcro. 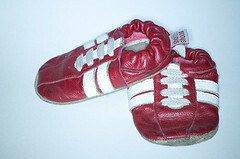 This will enable you to make a Velcro strap. Simply attach the loop side to the hook side with the adhesive side facing outwards. Click the image on the left for more details. Step 2 – Attach LEDs to the adhesive side of the Velcro. 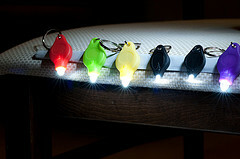 Go one LED at a time until the entire strap is covered with LEDs. Now you have a LED strip. Before you run and bind it around your lens, note that this will make an excellent strip light. OK, now bind it around your lens. See the image on the left. This is how it looks like on my sweet Nikon 85/1.8. 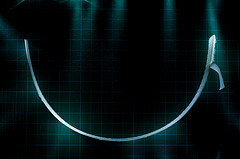 And here is a link to the setup for the ring light photograph. Note the LEDs on the chair and on the floor. Since LEDs are so small and so focused you can have full control on where you want light and where you want dark. 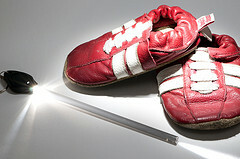 In the image to the left (click for more info) I used a restricted LED light to throw light on the edges and white portions of the shoe. I did this with a technique called light painting, however, the same principle will apply to static light as well. The light bean from the LED was not focused enough so I used a black straw (gridspot leftovers) to further restrict the light. In fact, the light beam was so narrow that it was almost pen like. I had total control on where I wanted the light to hit. Similarly, you can position restricted kickers or rim lights made from LEDs. 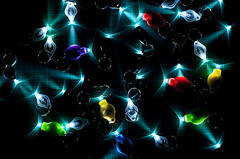 Last LED thingy for today is a personal favorite – Light Painting. In light painting, you use long exposure in a dark location and a moving light source to burn specific and very accurate parts of the image with light. Here is how it works. Since the setup is dark, the long exposure by itself contributes very little to light hitting the sensor. When you introduce a bright light source, it has a huge impact on the sensor – a spot of light will be created where the light source was. If the light source is moving, a stripe will be recorded. 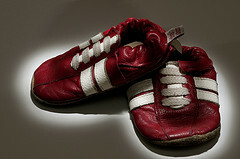 The shoes – I used a similar LED and straw device to the one describe in the Total Control section to create interesting light on and under the shoes. – LEDs are cheap, really cheap, however they provide little light which makes them ideal for small setups. – LEDs have weird behaving light – bluish WB and poor CRI. Make sure you know what to expect by experimenting. – LEDs are small and focused – they will produce very hard light, and you can exercise great control over that light.